Emmy Mom--One Day at a Time: He's How Old?? Last week I was cleaning out my bedroom dressers. Don't ask, I don't know what came over me either. One of the dressers in our bedroom actually has very little clothes in it, it is mostly old journals, memorabilia and a whole bunch of other who knows what junk. I found a spiral notebook, not too surprising I have a thing for notebooks and blank paper, and started flipping through it. 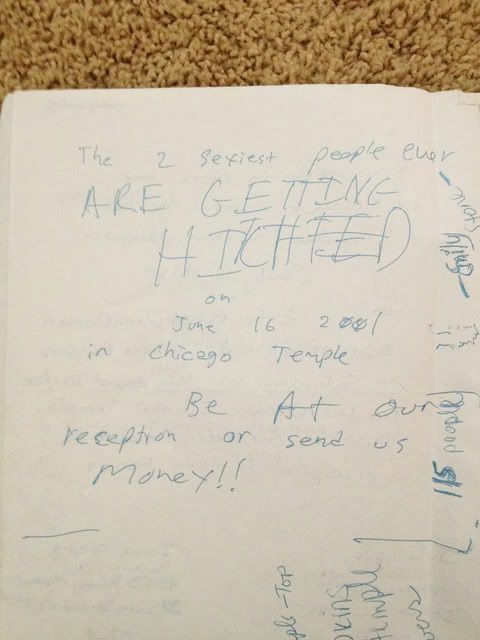 It was my wedding planning notebook. The notebook I took with me to the Bridal Fair, the one where I wrote a list of who we were going to invite, possible photographers, and all of that necessary information. reception or send us money!!" This was my husband's submission for what we should have printed on our wedding invitations. Needless to say he didn't get his way. It is because it is the guy who wrote this birthday today!! To my husband who has always made me laugh, always been there for me, always worked hard to take care of all of us and is my ultimate and forever best friend, I love you and hope you have a wonderful birthday. What a wonderful thing to come across while cleaning. I bet that one piece of paper brought back countless memories. Too cute! I bet this put a big smile on your face! Happy b-day to your husband! That is so sweet! I hope he has a great birthday! Haha, that's awesome! You gotta love guys, especially when planning weddings :). Happy birthday to him! so sweet and love his idea-- especially sending money-- that would be nice!! I have 2 friends with birthdays today too! hahaha! At least he cleared it with you first. ;) That's funny. I sent him a bday text. I love that! Happy Birthday to your husband! You should totally get that paper framed! Awww!! Happy Birthday. Love this note! Ha! Funny husbands are the best! Happy Birthday to Eric, the best brother ever!!! That is really cute! It is the fun things like this that we find that remind us how much we love them! What a great find!! This is classic!! Makes me want to clean more!! Happy Birthday to your man! My husband's birthday is on Sunday! Too funny. Happy Birthday to Eric! How do you make a smirk with emoticons? I so need a smirk right now. What a funny guy! I think wedding receptions are mostly for girls, and when I hear about things like that, it always makes me laugh and wonder what a wedding reception planned out entirely by a typical guy would be like. Happy birthday, Eric! I hope it was spectacular. haha pretty funny!! and a true sentiment!! I'm wondering if he even remembers writing that! Too cute, and happy birthday to him! That is hilarious! Happy Birthday to the hubby! That is so cute! How awesome to find that and have a little laugh. I love it!